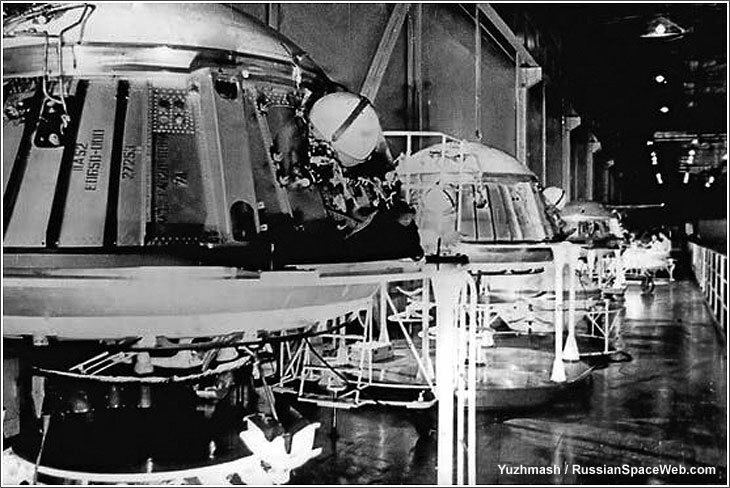 At the heart of the Soviet manned lunar lander was the Block E propulsion system. The clamshell-shaped structure of Block E contained a dual engine, which was designed to provide thrust during the crucial final descent and the ascent of a single Soviet cosmonaut to the lunar surface. However long after the end of the Cold War competition between the two superpowers, the engineering legacy of Block E lived on in the USSR, Ukraine and Europe. Four decades after its original development, the remarkable design even got a chance to play a role in the Chinese space program! The colossal vehicle conceived for a trip to the Moon included a total of six propulsion stages designated from bottom to top according to the letters of the Russian alphabet: A, B, V, G, D, E and I. Appreciating the enormous scope of the task and the deadline for its completion just three years away, Korolev planned to distribute the responsibilities for the N1-L3 complex across the industry. At the time, Mikhail Yangel led OKB-586, which had accumulated considerable experience in the development of rocket engines burning hypergolic storable propellants. 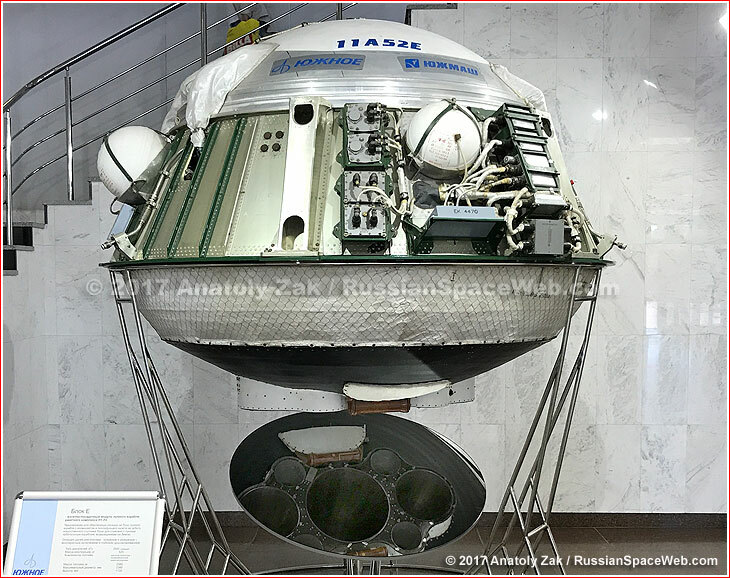 Korolev hoped to use such propulsion systems on the Block D and Block E stages of the L3 complex, which would have to conduct multiple maneuvers in the course of a 12-day-long lunar expedition. Alternatively, semi-cryogenic versions of these stages were also reportedly under consideration. They were designated Block E1 and Block E2, as well as Block D1 and Block D2. Early in the project, Korolev considered outsourcing to OKB-586 a total of four propulsion systems, known as Blocks G, D, E and I. In August 1964, a group of 24 engineers from OKB-586 led by Yangel's close associate Vasily Budnik arrived at Korolev's OKB-1 in Podlipki near Moscow for a joint assessment of possible ways to subdivide the project. 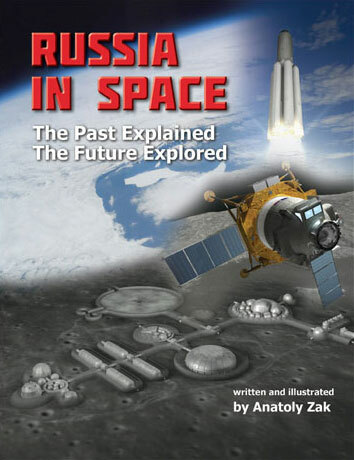 Korolev and his deputy Vasily Mishin knew Budnik from the days of searching for the German rocket technology in 1945. The Ukrainian team stayed in Moscow and worked in Podlipki for several months, while the two sides brainstormed various design configurations. The joint team formally completed the pre-preliminary design of the N1-L3 complex on Dec. 30, 1964. (774) Engineers apparently hammered out the details for around three more months. By the middle of March 1965, engineers decided to switch Block G and Block D back to kerosene fuel and cryogenic oxidizer, while Block E and Block I retained storable propellants. Of the latter two, OKB-586 took responsibility for the development of Block E, which would carry the lunar lander to the Moon. (810) The propulsion systems for Block I was delegated to the design bureau led by Aleksei Isaev, while the propulsion department at OKB-1 led by M. V. Melnikov took charge of the kerosene-burning engine on Block D.
Not surprisingly, the absolute reliability of the propulsion system on Block E became a paramount for its developers. Unlike their US counterparts, Soviet engineers opted for a backup engine on their lunar lander. 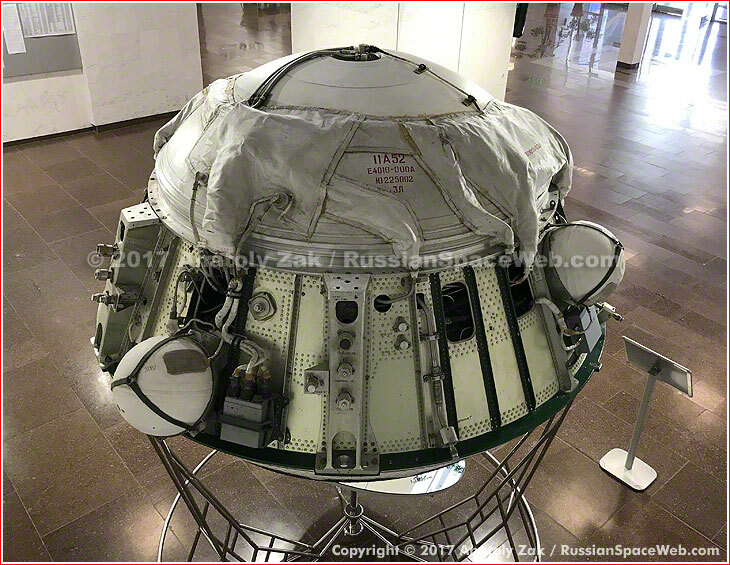 They already adhered to a similar principle when working on the main propulsion system of the Soyuz 7K-OK spacecraft, which preceded work on the L3 complex. Within the overall architecture of the LK lander, the riveted structure of Block E was located below the cosmonaut cabin and above the landing gear structure. Block E served as an interface for the two other components and it absorbed all the external mechanical loads on the vehicle. Block E also contained propellant tanks and served as a structural core of the lander. The stage was comprised of the 11D410 propulsion system, oxidizer and fuel tanks, the structural backbone, bottom heat shield, pneumatic and hydraulic system, components of the flight control system, thermal control systems and thermal shielding. The exotic architecture of Block E and the entire LK vehicle was dictated, first of all, by severe mass restrictions and an effort to keep the vehicle's center of gravity as low as possible. It was necessary to ensure's the lander vertical position during a treacherous touchdown on what was likely to be an uneven terrain. 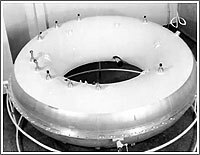 To achieve that, the tank for the oxidizer, as the heaviest propellant component, was placed below the fuel tank and it was shaped in the form of a torus surrounding the propulsion system. 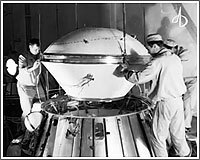 The fuel tank was made of two dome-shaped bulkheads connected by a cone structure. The Block E was designed to autonomously function in space for as long as four days. In order to keep the liquid propellant components of the module within the required temperature limits, an elaborate thermal protection system was developed. The bottom heat shield of the stage was made of thin titanium sheets. It was intended to protect the LK spacecraft from the engine exhaust and from fragments of the lunar soil. The semi-spherical shape of the shield with the pressure center aligned with the center of gravity of the module was designed to minimize the destabilizing dynamics of gas exhaust ricocheting from the lunar surface or from the landing platform of the lunar module. The exterior of Block E was covered with up to 90 layers of thermal insulation. A special polyethylene film with a ruffled surface was developed for the purpose of minimizing heat transfer between the layers. Around five percent of Block-E's exterior surface, which remained exposed, was thoroughly polished to reflect as much heat as possible. Special insulation covers were glued to the exposed nozzles of the engines, which were, otherwise, almost completely enclosed into the structure of the stage. The nozzle of the main engine would be closed with a special thermal cover after landing on the Moon. 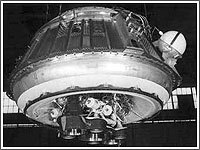 The propellant tanks of Block E would be actively cooled with a special piping network hooked up to the main life-support system of the LK spacecraft. Together, the two engines formed the propulsion system designated 11D410. Both engines burned a mix of unsymmetrical dimethyl hydrazine and nitrogen tetroxide. The hypergolic propellant components guaranteed their easy storage during a lunar expedition lasting at least 11 or 12 days. The main engine would have to ignite twice during the flight -- first, during the 10-second final descent to the Moon, after the LK spacecraft had separated from the Block D propulsion system. The same engine would fire for the second time for the liftoff and the ascent from the Moon to reach the lunar orbit before a rendezvous with the LOK orbiting spacecraft. To give the pilot of the LK lander the capability for horizontal maneuvering and hovering during the final approach to the landing site on the Moon, the 11D411 main engine was designed to throttle its thrust up and down. With a nominal thrust of two tons, cosmonaut could vary it as much as 300 kilograms higher or lower from the 825 kilogram deep-throttle mode. 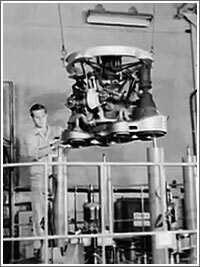 Both engines on Block E were designed for ignition in weightlessness, which required a special pressurization system. Initially, there was a plan to install inflatable bellows inside the tanks, which would be filled with helium gas and push the propellant toward the engines. However, when the project had already reached the experimental stage, the flexible membrane of the bellow was found to be prone to leaks after interaction with highly corrosive propellant components. All attempts to find a suitable replacement were unsuccessful. During propellant loading, the lower cavities of the tanks would be fully filled, while the upper section would be partially filled to leave some gas cushions. In weightlessness, when the gas and liquid could take an unpredictable shape, the capillary filters would prevent gas from going through, while allowing the liquid in. A specially equipped Tupolev-16 aircraft with weightlessness test stands was used to confirm the viability of the separators' design. Block E for the LK lander during production in Dnepropetrovsk. 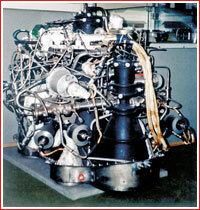 Under the agreement between Sergei Korolev and Mikhail Yangel, development of the Block E propulsion system was delegated to the OKB-586 design bureau in Dnepropetrovsk, then Ukrainian SSR. Inside the bureau, Vladimir Utkin assigned the organization's chief engineer Boris Gubanov to oversee the project. The propulsion system for Block E was developed by a group of engineers at the KB-4 design unit within OKB-586 led by Ivan Ivanov. Live test firings of the 11D410 engine began at Facility No. 5 in NII-229 (NIIKhIMMash) in Zagorsk (today Sergiev Posad) in February 1969. From that point on, a team of propulsion specialists from OKB-586 would travel to the test site on a monthly basis to support the trials. Eventually, the test firings were moved to Stand No. 4 at Facility 8. 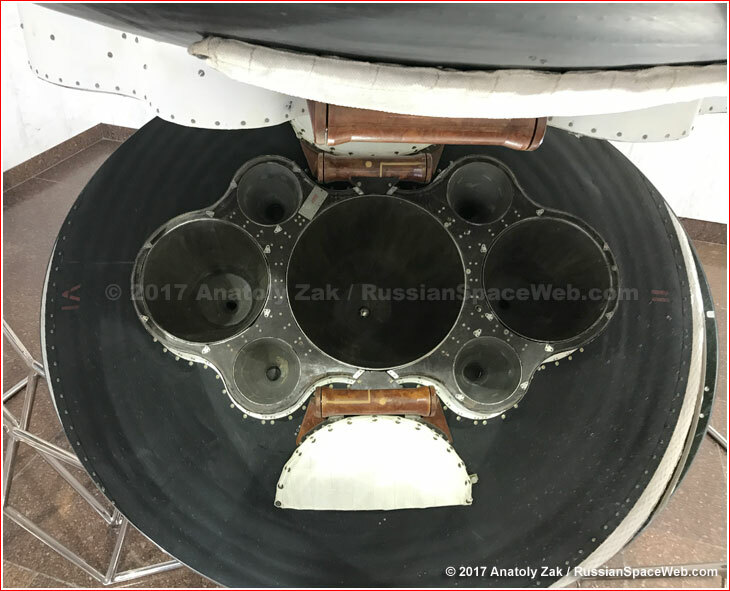 The engines were then flight-tested during three launches of the T2K prototypes of the LK lander and reportedly performed as planned during various maneuvers in 1970 and 1971. After the cancellation of the L3 program in 1974, KB Yuzhnoe used the experience with the development of Block E to build an upper stage for the Tsyklon-3 launch vehicle and other compact propulsion systems with multiple ignition capabilities for the Soviet ballistic missiles. (809) Such engines as the RD-866 and RD-869 used modified combustion chambers from the Block E engines. During the post-Soviet period, KB Yuzhnoe relied on the design of the propulsion system for Block E to develop an upper stage for the European Vega launcher. 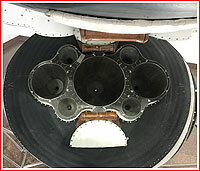 An already available cache of combustion chambers was used to build Vega's engines. Later, the Ukrainian company also attempted to resume their production. Around 2008 and in 2017, Chinese entities bought rights for technology transfer related to Block E and its propulsion system from KB Yuzhnoe.